The group is more tan (ok, sunburnt) and much more knowledgeable than when we got here. 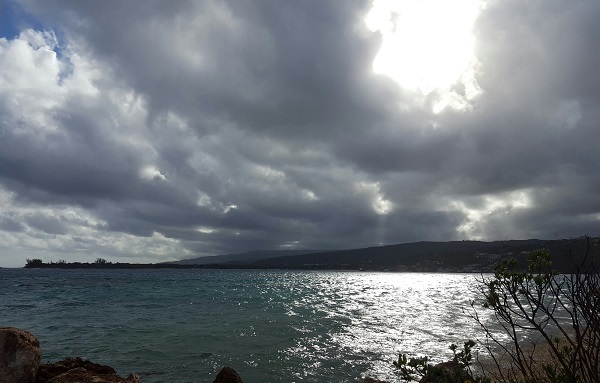 As usual, our final day here in Jamaica began with flat calm seas and very little wind — it’s our very own annual tradition. Some people got one last dip in the water before breakfast and our trip to the airport for the flight back to cold (but not snowy) New York. This year’s class had the worst weather in the history of the course. 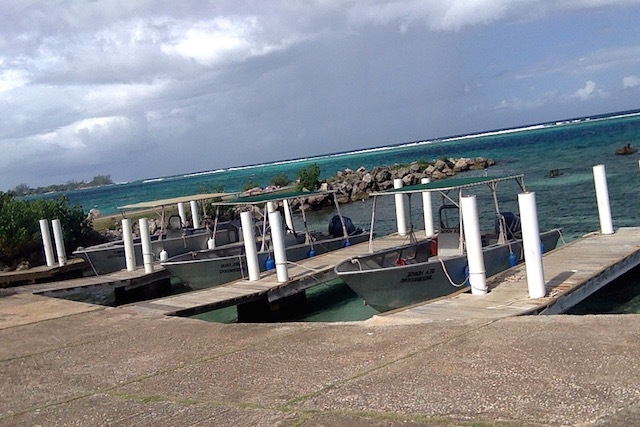 This presented real challenges to the students in terms of being able to get in the water and see the reef firsthand. Luckily, the seas calmed down the past few days and our new divers got to do some “fun” dives instead of training. Both of us would like to thank the students for rolling with the punches the weather threw us this year. We had a really good group of students and despite their reduced time in the water there were as many eagle ray and turtle spottings this year as we normally get so our class got the most out of their time on the reef. Can’t believe it’s our last day in Jamaica. It’s gone by so fast, especially these last few days squeezing in as much water time and dives as possible. Yesterday morning Bri, Tony and I went out on our first open water dive as non-DITs! Bri and I saw a sea turtle and unfortunately her GoPro broke at 30 ft down or we’d have photo evidence. But the memory for us is awesome. Yesterday and today was mostly spent brushing up on our scientific names (Stegastes adustus anyone?) and trying to round out our collections with as much algae as possible. Rachel and I had to separate our voracious urchins from our algae sea table as they were rapidly devouring our collection. 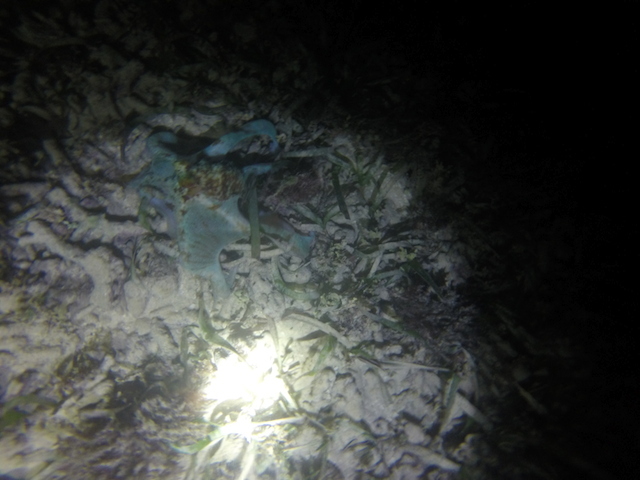 Jess, Alex and Juali managed to snag some brittle stars without them losing a limb and Bri and Tony were brave enough to explore the reef crest- the surge was pretty strong but they made it back with some stuff in their collection bags. Precious is bringing out the Jamaican specialties for our last couple of days- we’ve had bammy, ackee with salt fish, and breadfruit so far, and today is patty day with the famously delicious cocoa buns. The food has been so good, but I know Colin and I at least are craving a big ol’ slice of pizza back in NY. 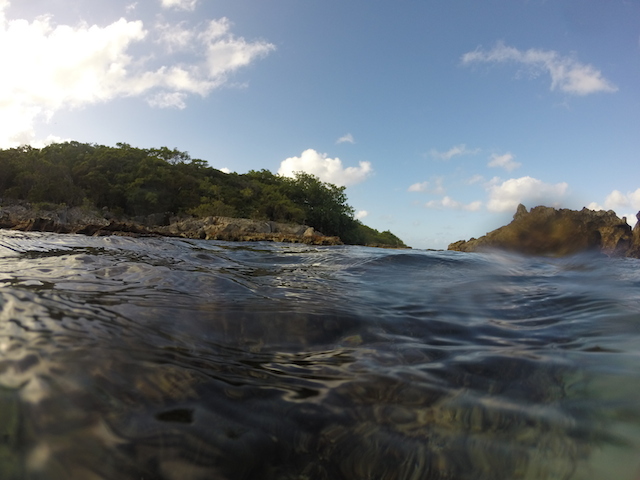 This morning the water was calm enough to head over to Rio Bueno for a dive. It was absolutely amazing. At around 20 feet the reef face drops off like a sheer cliff, and we went back and forth at 60 ft and 45 ft exploring the face. Dr Warren speared 3 lionfish (the only way to beat ‘em is to eat ‘em) and Bri thought she may have seen a caribbean reef shark down near the bottom. Mostly we got to float past huge sea fans, brightly colored fish and corals, and schools of gorgeous blue chromis that waterfall-dove over the reef face past us. That dive is definitely a highlight of the trip for me. Tonight we have our final exam and are cleaning up the wet lab and packing for an early start tomorrow. The best parts of the trip for me were getting scuba certified and seeing 3 octopuses (no, people, it is not “octopi”). They’re one of my favorite animals and let me tell you I’m still kicking myself over missing that they were in the cephalopod family on our first exam- I blame the mosquito assault on my legs that was happening as I attempted to finish as quickly as possible. For awesome octopus facts and to learn more see The Soul of an Octopus by Sy Montgomery. I think that’s all the octopus plugging I have for today. Thanks for reading mom! It’s almost time to go back to the cold and dry weather in New York. The end approached faster than expected and most of us wish we could stay in here. All we can do is make the most out the next two days because we won’t be see this bright sun in New York for a few months. The weather is not the only good thing about this place, it’s also the people, the laidback lifestyle, the tasty food and the great view of the ocean from my balcony. Jamaica definitely met all of our expectation despite the unexpected winds of the first few days. Going from an 80-degrees weather to shoveling snow will probably be the harshest transition ever. At least we can all say we had a great time, learned a lot and made friendships that hopefully will last a long time. We were also able to swim in a coral reef, which was a new experience for some of us. Before this trip I had no idea the diversity of species that can be found in a reef. I also ignored its true importance and why we should take care of it. Most people describe reefs as an attraction for tourists, not knowing how important they are for the animals in it and for us as well. Reefs not only give a home for thousands of species but also protect our coastlines after big storms. I will use this trip not only to have great stories to tell, but also to inform people about the importance of coral reefs in our ecosystem and our daily lives. Gone are my days, it is the end! 18 Jan AM – Sunny with a chance of Rain? We can finally say that the wind has died down compared to last week, but now it seems like we need to be concerned with the rain? This Jamaican weather is really messing with all of our emotions. Yesterday it was so beautiful all day, except for when our afternoon rainstorm came rolling in. I don’t know if it can really be considered a rainstorm if it only rains for 10 minutes and then stops, but that’s what we’ve been having. This morning I woke up to a downpour of rain, and when I went downstairs for breakfast, the rain had already stopped and the sun came out. But hey, if we’re already supposed to be in the water, who really cares about getting wet in the rain, right? Yesterday we spent most of our day in the water and it was such a relief to finally be done with lectures and be able to spend all of our time actually looking at what learned about. 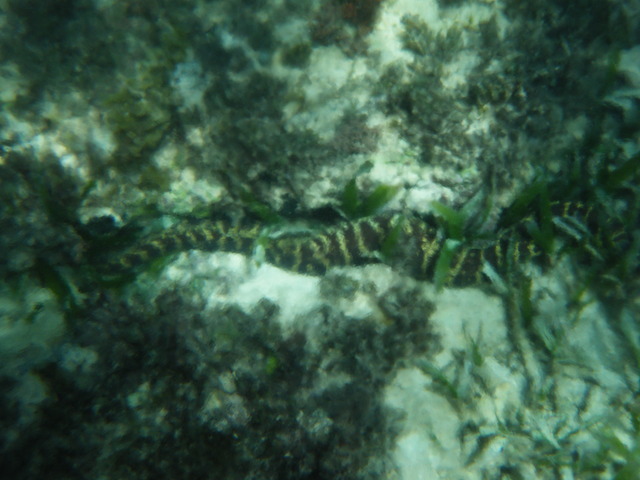 The DITs (divers in training) went out yesterday morning to finish up their certification, so TA Collin took the snorkelers out and we saw a huge eel (it was huge in my eyes). Then after the lunch, the DITs had returned so we all went and laid out to soak up some Jamaican sun before it was gone. But as we’re lying there, it kept getting darker and the clouds were rolling in pretty quickly and it started to drizzle, but we were in denial and thought it was just some sea spray from the ocean. Once we realized it was actually rain and that it was going to downpour on us, we all picked up our stuff and ran in search of dry land! 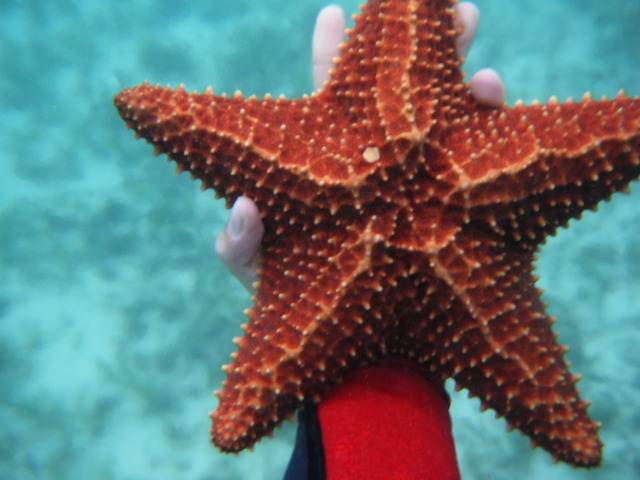 Then the rain stopped and we all went back out into the water and Shannon found a beautiful starfish that we all took pictures of, and then she collected it and put it in her wet lab collection (don’t worry the animals get released back after were done looking at them). Alex collected some pretty cool things for our collection also, but his favorite were the donkey dungs, and I think its because they were the easiest to catch… the poor things don’t move, they just sit at the bottom of the ocean! I think its pretty safe to say we all had our fun in the sun yesterday, hopefully today well have just as much fun! 17 Jan PM – No D.I.T.’s Left Behind! After many hopeful mornings and a few not so hopeful mornings we are proud to say that all the DIT’s (divers in training) are now just D’s (divers)! In other words, we all passed our SCUBA certifications and with 2 days to spare. So now we can explore the hole, or maybe just hover at the bottom and take better photos but always with a buddy. It was a little tricky getting here, some of us (only one of us) had some stubborn ear issues, but their stubborn anyways so I guess they were just SOL, maybe they’ll remember what that means later. 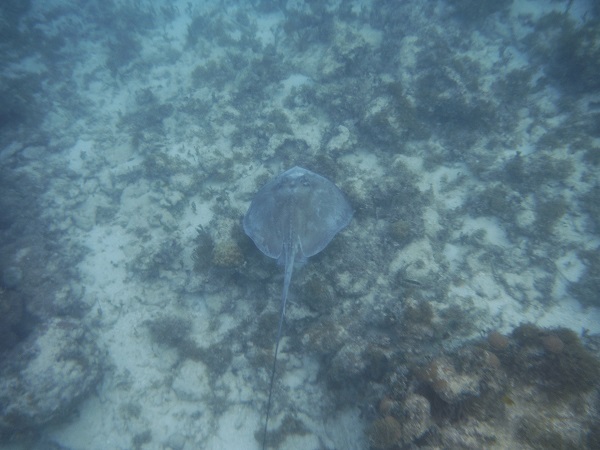 The photo sadly is not from the dives because no cameras for DITs, so instead here is a cool photo of a Southern Stingray we saw snorkeling yesterday- yes it was big, and yes we followed it. Then we followed the barracuda; don’t worry mom I still have all my toes but the sun is definitely going to my head! We stretched out the day with midafternoon Yoga taught by one of the fabulous grad students and I think everyone fried their brains in the sun even more- there are plenty of rosy cheeks to be found. And now as everyone starts to figure out their final presentations between snorkel trips it’s a little bittersweet that the trip is coming to an end. I know for me at least, I’ll be coming back and hopefully the wind stays away. The water this morning before going diving. Today is a great day because yesterday was our exam, which means, WE ARE DONE WITH OUR LAB PRACTICAL! Of course we’ll still have work for finding new species to identify and knowing their scientific names but it’s much nicer not having to worry about a huge exam all the time. I feel like this week is going to consist of a lot of water time to make up for the lack of water time we’ve had thus far. But what’s also wonderful is that, the wind had calmed down nearly right after our exam last night so my theory is that our stress from the exam was causing the wind. Yes, that is exactly how science and the atmosphere works. 1. Get all of your gear—cameras, wetsuits, fins, mask & snorkel, and of course, the all-important waterproof flashlight. 2. Find out what area of the dock doesn’t have Diadema (long-spined urchins) stuck to the wall—super painful to get stuck by one upon getting in the water. 3. Decide that the ladder is the safest bet and put your fins on before getting into the water, but be sure to look to make sure there are no urchins, scorpionfish or other terrifying things that can sting you. 4. Crawl into the water, terrify yourself with the flashlight, forget how to breathe with your snorkel, giggle at yourself, accidentally terrify someone by having your fins brush against them, and repeat. After all of us learned how to be normal human beings in the water at night (I hope someone gets my Spongebob reference), we then carried on our way. We found two octopii, some lobsters, an eel, and more Donkey Dung Sea Cucumbers (please look them up) and Urchins than we would want to be around on a given day. A small octopus that we found last night! 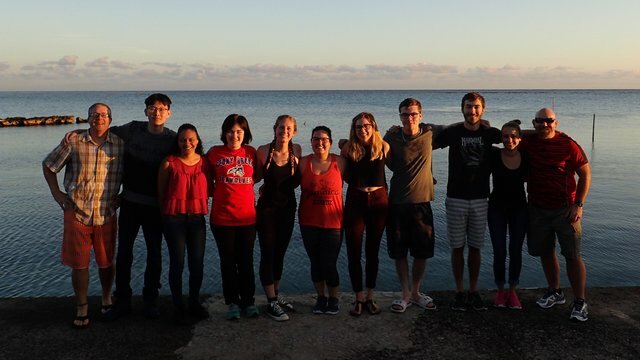 Today Rachel, Shannon, Alex, Tonny and I spent the first few hours of our day finishing our first two open water dives to finally become certified scuba divers! We were near a sand patch near the eco-reef in Discovery Bay but there weren’t too many creatures to get distracted by, which is good for this circumstance I guess. We did see a huge Southern Stingray, probably 3.5 feet in diameter, and Rachel saw a lionfish! All in all, if feels amazing to be in the water. Here’s to the next few days of exploring Discovery Bay! 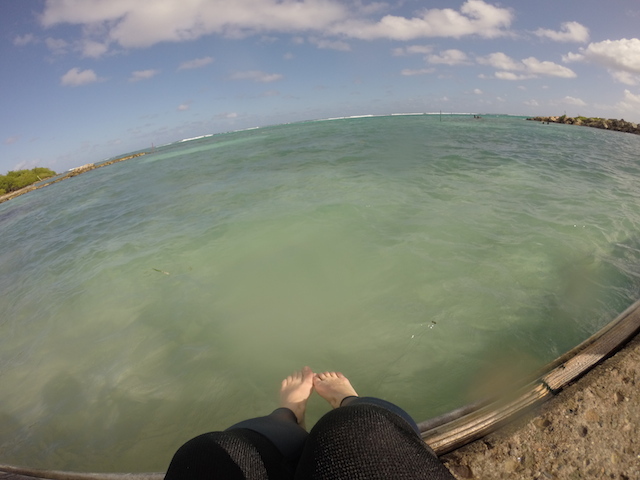 16 Jan PM – Finally Got To Dive! On our way to becoming divers! Today we had our first diving experience. Being underwater at a depth of 20ft for the first time was intense. Although it did take a few times to equalize my ears, it was a wonderful experience. We got to see various different species of coral and fish. We even got to see a large southern ray. Since we completed 2 of our training dives we are half way to becoming certified divers. 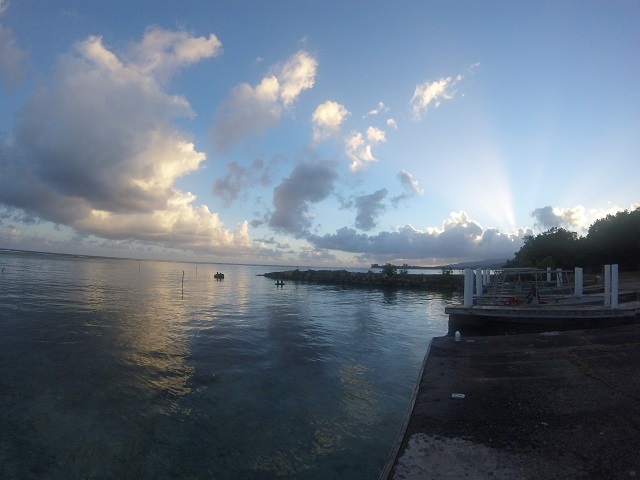 Today we plan to get back in the water to snorkel to work on our collections for the identification quiz in the coming days. We had our lab partial exam last night, it was hard but fair. There was a lot of material on the exam, but we all studied hard and conquered it. It was a very interesting exam to say the least. Walking around the lab looking for index cards, while being eaten by mosquitos was a new experience. It’s a an experience I wouldn’t go looking for, but I’m glad I had it. Hoping to get certified tomorrow, so we can continue our dives. After exploring the Green Grotto caves with our tour guide Brian we headed across the street to the Ultimate Jerk restaurant. Vegetarians and carnivores alike were stuffed to the gills. As usual, most of us left room for grape nut ice cream from the adjoining “Ultimate Sweets and treats” shop. The fruitcake was avoided. We got back to the marine lab around 6 and had an evening to study before our exam today. 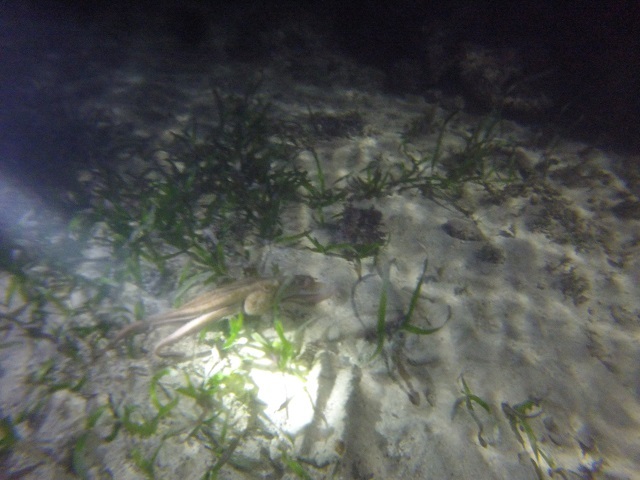 It was a pretty quiet evening but our TA, Colin, went for a night snorkel and saw two stingrays and some scorpionfish! We are hoping to get out on a night snorkel tonight after the exam- my goal is to see an octopus before we leave! Unfortunately the wind proved too much again this morning for the DITs (divers in training) and our open water dives were postponed until tomorrow. A little wave action didn’t deter a group of us from going snorkeling though, and we got a fair amount of pictures in the mangroves and at the reef crest. We saw a spotted eagle ray again on our way out, as well as some gorgeous parrotfish on the reef. 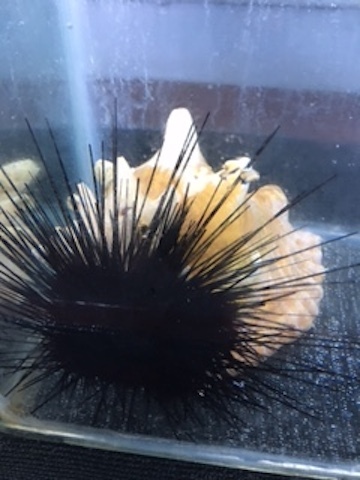 Colin is working on a project with Diadema, a long spined urchin, and after snorkeling we dried off in the sun watching him dive around trying to collect rocks for them to eat algae off of. The surge was pretty strong so it looked a bit of a difficult trip. Not one has died yet though! Urchins, that is, not Colins. A Diadema in the wet lab. 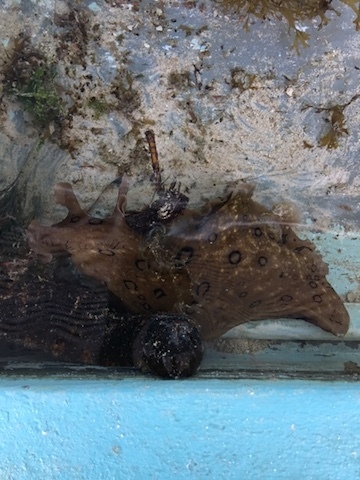 Lastly, we had to release the sea hare, but not before it squirted bright purple ink all over. TA Amber brought it, still leaking purple, back into the ocean. May she eat algae forevermore. A sea hare in the sea table. 15 Jan PM – Down down to the cave! A part of the cave entrance. These last few days have brought us lot of new information, not only about the species we are analyzing in the lab, but also about the history of the island. Jamaica is a very particular place full of natural and manmade attractions. Today we witnessed one of the greatest caves on earth. I’ve never felt so interested and intrigued anywhere else. Each rock served a purpose since before the colonization of the Spanish on the island. The cave was originally shelter for the natives and later on for the freed slaves. Within this wonderful place, we were able to find bats, snakes, marine life, limestone and much more. One of the most interesting facts about this place was the fact that a portion of the cave was once used as a bar. You can see where the stage and the bar were located not many years ago. Every corner has a history behind it and it’s a place I would love to visit again. 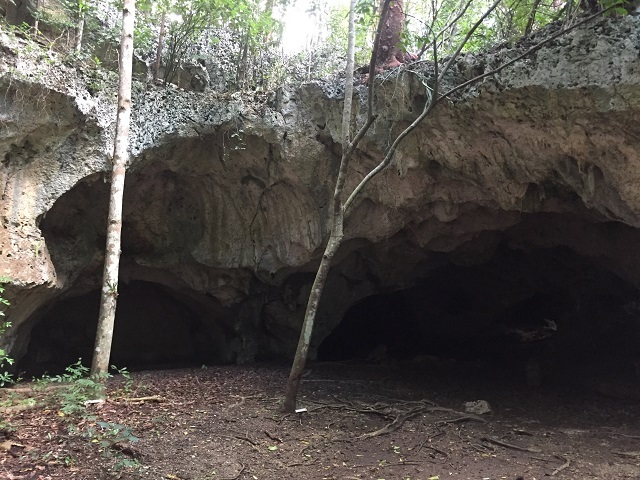 The government has helped preserved this cave, its history and even the original trees within in. 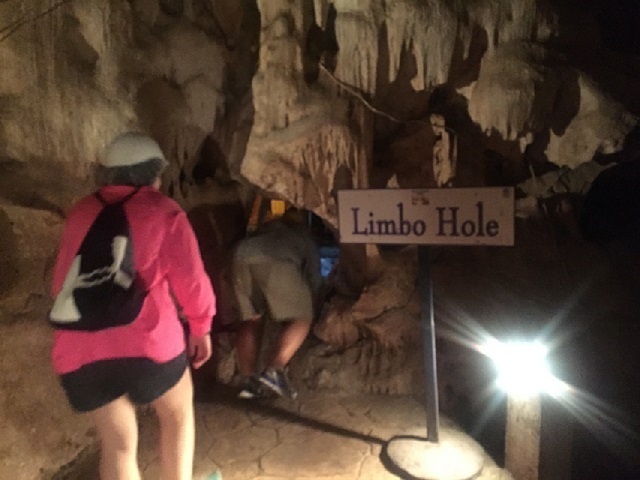 However, the best part of the day was to see the adventurous side of Professor Peterson and his ability to go through a limbo hole that not everyone was willing to go through. Regardless of the wind, I am still happy to be here. Not going to lie, I’d rather be IN the water than look at it longingly, but nonetheless, I’m still happy I made this trip. I find that more often than not, I forget why I’m studying marine science because I am eyeball deep in papers and projects. It becomes this abstract idea that I can intellectually explain and understand, but in the same way someone might explain a vacation from years and years ago. 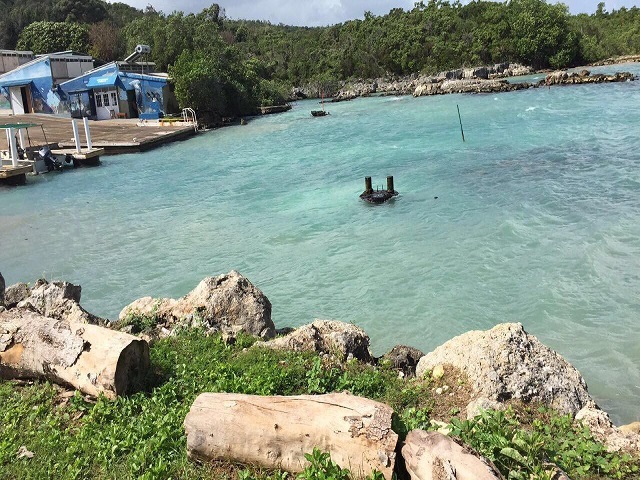 The ability to be able to perform field work, whether on Long Island or better yet in Jamaica, is a solid reminder of why I want to do this and why I think it’s important. For instance, you hear about plastics in the ocean but you don’t really think about it. The amount of plastic garbage that I’ve seen littering the coast and washing ashore is astounding. But there again, until you SEE it, you don’t think about it. I’d love to tell you all more about the crazy cool things we’ve seen in the water but sadly we’ve only been in the water once and that was 2 days ago now. The hole (a 45m-ish drop in the bay) was overwhelming though. 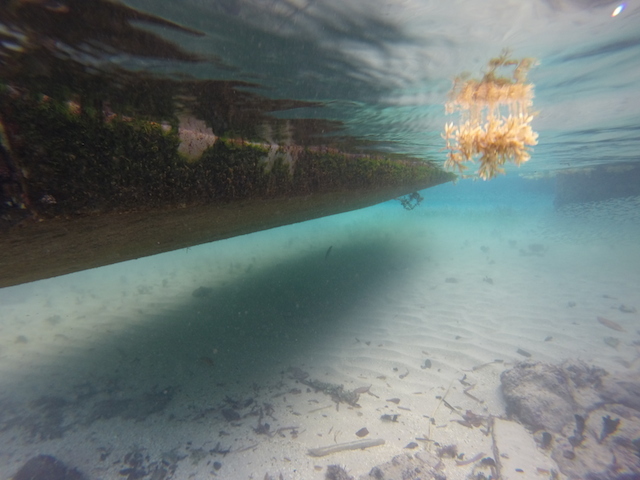 It was a bit disorienting how little I thought I saw vs how clear the water actually was. I thought I was only seeing a couple of inches but it was probably closer to 15ft but the distance didn’t really matter since it was just blue. It was an interesting reminder of how tiny I am in the larger picture… or at least a reminder that as much as we would like to think we are the top of the food chain (and you can argue we are) we are nothing but a guest in the ocean and we are far out of our element. We’re going to the Green Grotto later, so those posts will probably be more fun that this one. But don’t worry, while we may be a little cranky that we are swimming we are well watered and fed and sleeping fine!